When asked to estimate the total size of their target market, expatriate marketers often face difficulties with the answer. There’s virtually no global data on international expatriation, and the available information usually does not differentiate between migrants, international students and high-income-expatriates. So what can you say the next time your boss asks you where to spend the expatriate marketing budget? 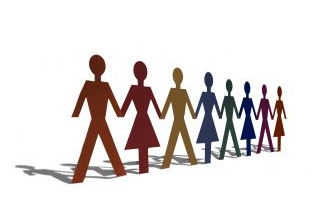 According to UN Statistics, some 215 million people lived outside their home country in 2011. Obviously, not all of these are relevant target groups for expatriate service providers. An offshore bank is probably not looking to attract foreign construction workers in the Middle East, and an international expat insurance agency will not be focusing on people who settled in the United States twenty years ago. How many high-income expats are there? Unfortunately, there is hardly any global data on expatriate income, and the few studies like the HSBC Expat Explorer survey are skewed towards specific target groups like British expats. To estimate the number of high-income expatriates on a global scale we have to use an indicator such as the level of education. According to OECD (Organisation for Economic Co-operation and Development) statistics, 22.7% of migrants living in OECD countries have a tertiary education. If we took this as a global average, there would be approximately 40 million high-income individuals living abroad. Of course, the percentage of highly skilled workers differs significantly between countries, e.g. between countries like Austria (9%) and Belgium (25%). 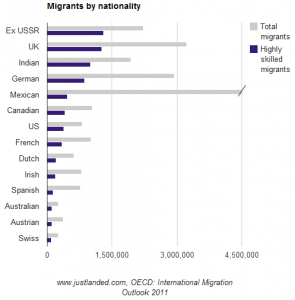 Immigration statistics for non-OECD countries are even harder to come by. In order to estimate the number of highly skilled expats in those countries, we adapted the OECD quota for different regions, with financial centers such as Hong Kong and Singapore attracting a higher percentage of highly skilled workers than – for example – Russia. Even though this is not a perfectly precise model, the data provides some interesting insights into the actual size and shape of the expat market. The US, Canada and Australia still have the highest number of highly skilled expats, but countries like Russia are catching up. 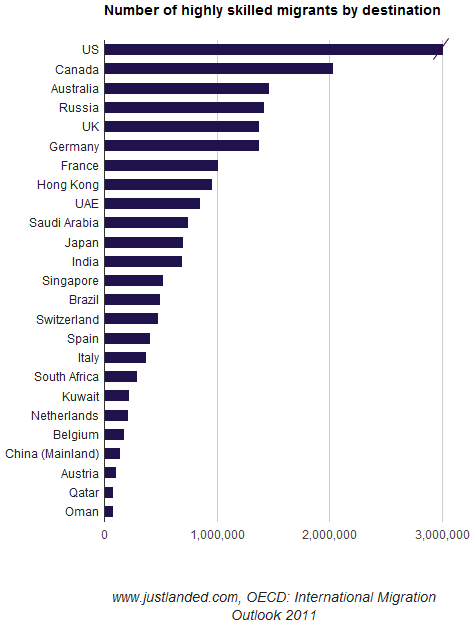 Despite the rapid development of the BRIC-countries (Brazil, Russia, India and China), the traditional migrant destinations of the US, UK and Australia still have the largest populations of highly skilled foreigners. Though countries like Russia, India and the Middle East region are catching up in terms of total migrant population, they still do not attract as many skilled migrants as the traditional expat destinations. Besides foreign population, the yearly influx of migrants is an important criteria for expat advertising campaigns, as it reflects the number of new arrivals that are looking for services such as insurance, banking, telecommunications and others. 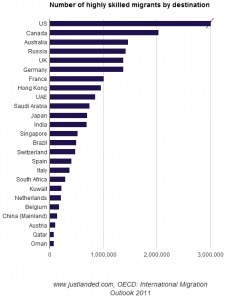 Among OECD countries, the US and the UK continue to be the top destinations for new arrivals. Germany ranks third on the list, with 606,300 people moving there each year. Which nationalities should you target? An increasing number of highly educated expats comes from developing countries like Russia and India. The nationality of the migrants is just as important as the destination country. Who’s moving countries, and which nationalities make the most money living abroad? Traditionally, many expat service providers have focused on British and US citizens abroad. A look at the number of highly qualified expats, however, tells a very different story. According to our estimates, the former USSR has the highest number of highly qualified people living abroad, followed by the UK, Germany and India. Some marketers have understood this data, and have adapted their marketing strategy. To reach high-income Russians abroad, insurance providers like DKV Globality have started offering their products in Russian. In Germany, companies are starting to notice the market potential of Germans living abroad. DKB (a banking institution) just launched its first expat-only German current account, and other German providers are setting up expat divisions to claim a share of this market. Where should you allocate expat budgets? There is a growing population of high-income expats from countries such as Russia and India living abroad. While marketers have traditionally focused on western expats, these new target audiences still remain largely untapped. Traditional expat destinations like the US and UK still attract most highly skilled migrants, but countries such as Germany and Canada are gaining traction. When looking for new markets, the number of foreigners in a country is not a good indicator alone. You also need to check how many people move there each year, as these are prospective customers for many expat-specific services. If you are interested in targeting expats, read this article on Expat Advertising. Questions? Not sure how to target the right expat audience? Let us know in the comments and we’ll see if we can help. Posted in Expat Trends.Tagged expat marketing, expat trends, highly skilled migrants, migration.